A domain is the highest classification of living organisms. There are only three: Bacteria, Archea, and Eukarya. All eukaryotes have membrane-bound organelles and a true nucleus. Other than that, the group is extremely diverse. It contains everything from an Asian elephant to a cottonwood tree to a diatom. Supergroups are relatively new classifications. It was previously believed that there were only four kingdoms of eukaryotes: animals, plants, fungi, and protists. 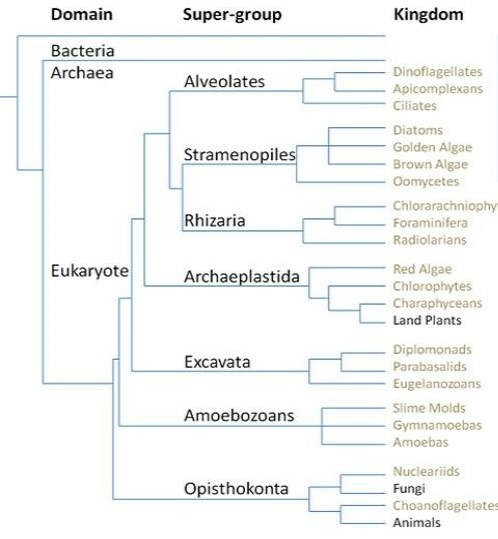 Bacteria were even considered a kingdom before domains were used. Now, however, we know there are 22-24 kingdoms of eukaryotes contained within seven supergroups. Organisms in the opisthokonta are characterized by having posterior flagella at some point in the life cycle. Fungi are classified under this group because they had motile spores at some point in their evolutionary history. However, the only group of fungi whose spores still move are the chitridiomycota. Humans are opisthokonts too because sperm is flagellated. 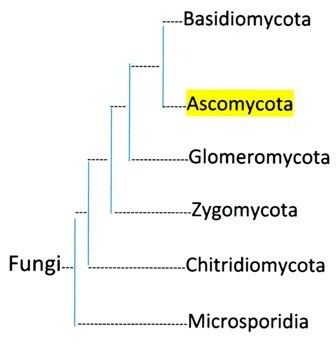 The five phyla of fungi (above) are based on their method of producing sexual spores. There is also a group called the deuteromycetes, or imperfect fungi, and they have no known sexual stage. An example of this is the fungus responsible for making penicillin. If a sexual stage is discovered in one of these fungi, they are moved to one of the five other phyla. The ascomycota have sexual spores (ascospores) borne internally in a sac-like structure called an ascus. 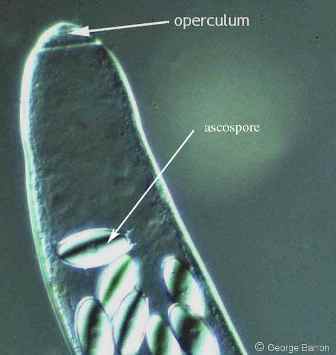 Their asexual spores (conidia) are borne externally on a conidophore. The fungus Cordyceps subsessilis is also in the phylum ascomycota. These fungi have asci that rip open to form a lid-like structure called an operculum (below). 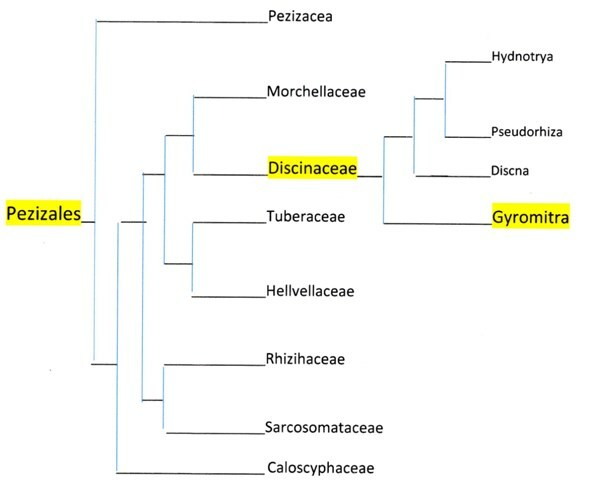 The pezizales are the only order of the pezizomycetes. The fungi in this family are variable; they can grow above or below ground. The surface of the fruiting bodies is brown and sometimes contorted. The stalk of the mushroom can also be contorted. The asci can be cylindrical or sac-like, with a rounded tip. Spores can be anywhere from brown to transparent. The name Gyromitra comes from the greek word guros, meaning a turn, and mitra meaning head. Fungi in this genus have convoluted caps. As mentioned earlier, the name esculenta means edible, somewhat paradoxically in this situation. The genus Gyromitra has not been extensively tested for DNA similarities. Therefore, the classification of species is more based on what they look like, not molecular data. 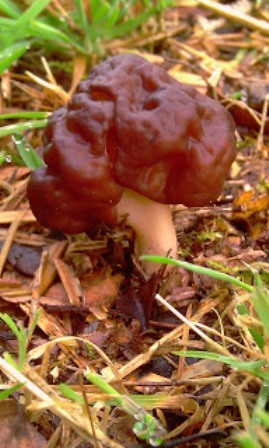 Gyromitra esculenta is classified by the fact that it fruits in spring, has a skinny stem with no bumps, and the cap is wrinkled and more reddish than brown. Now that you know how this fungus fits into the tree of life, learn about how it survives on the nutrition page.